A bit of good news for Newcastle fans. | NUFC Blog. 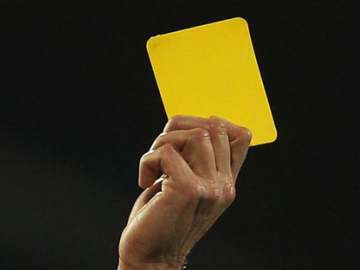 The yellow card - A familiar sight this season. Newcastle have had a habit of picking up yellow cards this season. In fact indiscipline has arguably played a large part in our season to date. A quick glance at the ‘Fair Play’ table should tell us all we need to know. It doesn’t make for pretty reading, but Newcastle have racked up 45 yellow cards and one red card in their 19 games so far this season and sit second from bottom of that particular league. Add Joey Barton’s and Mike Williamson’s respective three match bans for violent conduct into the mix and things don’t look so pretty. I think it’s pretty safe to rule out qualifying for Europe via the ‘back door’ for this season. Incidentally, the team currently leading the way in the Fair Play league is Fulham, closely followed by Blackpool. Imagine that eh? Mind you, with the way Blackpool have equipped themselves so far this season I wouldn’t rule anything out! Anyway, I’m getting off track. The pitfalls of picking up so many yellow cards are pretty obvious, as evidenced by Kevin Nolan’s absence yesterday and the suspension of Cheik Tiote a few weeks back. Yellow cards equal suspensions, and with Andy Carroll and Joey Barton both just one away and Jonas Gutierrez, Fabricio Coloccini and Jose Enrique all two bookings away from picking their fifth booking of the season, the consequences could be disastrous. It was pointed out to me on another site earlier on today that the five yellow card rule becomes redundant on the 31st December. I never knew this this, but it is good news for Newcastle. This means that you don’t get suspensions for picking up five bookings anymore, and a player will only get a suspension if they pick up ten bookings between now and the second Sunday in April, although the suspension will be for two matches instead of the usual one. (a) CAUTIONS ADMINISTERED ON THE FIELD OF PLAY. (i) If a player accumulates five cautions in any competition between the opening day of the playing season and the 31st December in the same season, he will be suspended automatically for a period covering one First Team Match plus a fine of £20. (ii) If a player accumulates five cautions in any Competition between the opening day of the playing season and the last day of the same season, he will be “warned as to his future conduct”. (iii) A player who has already been subject to disciplinary action as a result of receiving five cautions and then goes on to receive a further five cautions during the same season will be suspended for two first team matches plus a fine of £20. of the playing season and the second Sunday of April in the same season, he will be suspended automatically for a period covering two first team matches plus a fine of £20. of the playing season and the last day of the same season, he will be “severely censured and warned as to his future conduct”. (vi) If a player accumulates fifteen cautions in any competition between the opening date of the playing season and the last day of the same season, he will be suspended automatically for a period covering three first team matches plus a fine of £20. So that puts all of those players highlighted out of immediate danger whn it comes to suspensions due to the ‘totting up’ procedure. The only real risk we have is Cheik Tiote, who is only two bookings away from a two match ban, and the way he plays it would be pretty safe to assume that he will pick those up sooner rather than later. You see, the rules can work in our favour. Imagine if this wasn’t the case and we so many key players out with suspension all at the same time. It would be manic. Still, this should allay some fears, for now anyway. wait until you see it, N’zogbia won it, he would get a 9.0 for his dive like. Toonsy atleast thats something to look forward to, But I do hope that that will be something Pards will try to clamp down on as the indiscipline was getting out of hand. I know that all teams have certain players like Tiote that have to live on the edge, but we are starting to get labled as a Dirty Team which I dont think is a good tag to have. You know I keep thinking we’re not the “hard” team that we seem to be. CH and now AP appear appear to have instructed the team to rough up the opposition so we dont get outfought but that’s not the NUFC way – even in the BPL. Consider Blackpool, they’re doing it by playing football instead of muscling in on their opponents and I think we may have lost some of our edge from last season by thinking we must compete at all costs. PS Anyone got a link for the Midlands derby match ??? On the bright side, Wigan are now losing 2 – 1, now we just need Liverpool to remember how to play football and its a couple of good results for us tablewise. Apparently Ashley himself has told Pardew that Carroll is not for sale. Now do we believe him? The EPL is and always has been a physical league and as continental and players from various other leagues have become a part of it, naturally it has brought about change. At present the type of play reflects the differing cultures of the players who make up the league. Most people i believe are of the opinion that to-days game is less physical than say back in the day(your choice)to which i say yes, to a degree. There have been changes, for instant there no longer exists a shoulder charge, sure it`s still in the rules but will be called as a foul every time, sheparding the ball out of play was once known as obstuction. The goalies are pampered nowadays in comparison with earlier times, something I`m not sure i disagree with. But diving has become endemic to the game, with some very bad actors, who with the current camera angles, what makes them think the can get away with it ? I suppose as long as they can fool the ref. it`s ok.
On a personallevel i feel the game has became such a serious business (money)that it has lost the original ethos and certainly any sense of fair play that once existed. To the detriment of the game and to those who watch it unfortunately. But the news is not all bad, we get to see on a regular basis technical abilities that would have once brought applause, that are now expected of players and tacticle changes that continue to evolve and change……. We should go for Humbreto Suazo in January:D! Can this fcking week get any worse? Now fcking Wolves are winning at Liverpool!!! hahahaha N’Zogbia off, little turd. Practically exaclty the same way in which kaboul got sent of yesterday, ‘head butting’ Wilshire. Max Gradel, the Leeds winger, in a deal involving Leon Best. Latest rumour in twitter, just asked my mate who lives in Leeds, and supports them, what he was like, said pacey with a good cross on him, a more direct version of Routledge really. Look at his goals on youtube, canny shot on him as well. What make it laughable is the fine, these players get paid 10’s of thousands a week & they get fined £20 for frak sake….. I think they should add a coupe of zero’s on that & I bet you the game starts to see less cards being shown if the fine was £2000 for every yellow & £5000 for a red!!! Also, if Wolves score another goal, they’ll still be behind us & Cessepool will drop below us too… so not a bad result really…. We need Wolves to score again… come on Wolves…. Wigan are working really hard, pressing everything. Hopefully will be done in for Sunday!! N’zogbia banned for sunday, that’s a real boost. Wolves winning makes things very nervy. 5pts from 20th to 11th is unbeleivable at the half way stage. No AP you have to get this team playing on an equal footing by doing your phucking homework so you can prevent the opposition from scoring from obvious threatening positions. What did you do about reducing the effect of Bale and Lennon ? Yes you put Smithy in central midfield and Joey up front behind AC but no protection for Simmo or Perch and they couldnt cope. Pardwho is a mug and I am really concerned he will take us down – just as he did at Charlton. Liverpool 0 Wolves 1…eeerh ?…time for the big boys to step up to the plate NUFC !! Johno Toon 6 points, dream on mate …Wigan will cuff us for sure..
Why don’t people start blaming our sh!te players and lack of a reserve LB for the defeat instead of Pardew. He’s been here 3 weeks and he’s suppost to beat top 4 teams now is he with a piece of sh!te team. He hasn’t took over at Man U ffs. Players are blamed for poor performances alot, DJG, even when, sometimes, they’ve actually played rather well! I know they tried hard worky but they arn’t good enough to beat top 4 teams worky. Seriously what did people expect from the last 2 games? Theres things I would have done differently but we got beat 2-0 with Perch. What if we got beat 6-0 with Kadar at LB or something and Smith as a Wing back. Honestly what do people want? DJG-“Piece of sh!te team”?..Glad to see you support the lads! We’ll just flog Carroll, Enrique, Barton, Tiote etc in January then shall we. Useless, the lot of them. 4 players don’t make a team. Man C have about 20 of that quality. chicken vindaloo – pilau rice – keema naan – a large dollop of lime pickle on the left hand side & an equal measure of mango chutney on the right hand side. all down the hatch without touching the sides – very very nice – just leaving the plate to be licked clean before i retire to my pit for the evening. i reckon we need to re channel our frustration/aggression back into support for the lads & spare ourselves the anguish of turning on ourselves. We need to beat them really like not just to keep our heads above water but to keep them at arms length. Just think if we hadn’t got that last min equaliser they would be above us now in the table! Caulkin on twitter say ben arfa will sign permenant deal next week for 5 million. He then goes on to say it’s in the paper tomorrow, a ploy to sell some papers?? I wonder if it’s another 5 year special, hope so. all the journos are going with the story like on twitter so it seems pretty bang on. We MUST stick together now above all else. We all know what can happen if we don’t, don’t we? The lads need us to help them bounce back after 2 ‘expected’ tough games. Every game is now absolutely crucial. This is where it all gets interesting, half time. All the teams around/below us have tough games up next. We have to make that advantage count, as we’ve had 2 tough games, with 2 games against clubs languishing with us next. & zog out of the wigan game, bonus ball. Wonder how that ‘random’ fixyure computer managed to come up with a NE, scouse & brum derby all on the 16th? Are you implying the venerable F.A might have something to do with this!? DJG-Go support City then! By calling the team a piece of sh!te and claiming we have sh!te players, you’re branding them all. we play as a team, not individuals. If you want a team of high class individuals, head for Manchester. I didn’t say I want to become a glory supporter Im happy with my sh!te team but some people need to start accepting it instead of blaming the manager when we get beat off the top 4. DJG means well, he just has poor execution. For what it’s worth, I understand what he means. We have played three of the toughest teams in the league, won one of three yet Pardew is getting it in the neck. It is a bit crazy. Look at our team, we simply don’t have a squad capable of dealing with suspensions, injuries or off the boil performances. Especially when playing teams like Spurs and City. We will probably add two players in January. Also, Dan Gosling and Hatem Ben Arfa will return and we will secure safety. I am confident of that. Just to clarify I didn’t mean individuals don’t try or are bad at their job, we just don’t have the back-up or even the strength in some areas of the first team to compete with the big boys this season and probably next season unless Pardew gets lots of players in. We are all waiting on (no disrespect) a fairly young and inexperienced player in Gosling and a poor guy Benny who has a lot on his shoulders and can’t do it all. What does that tell you about the depth of our squad. At least we have centre midfield all wrapped up eh :) I don’t think we’re waiting too much on Gosling, not sure how much we’ll see of him this year tbh, but Arfa certainly..I hope fans don’t get too iffy with him if he’s off the pace for a fair old while-its to be expected really. Signing Benny is great but we also need players now. It`s true, there are games we lost, that could have gone the other way and others that we deserved at least a point from. At present the side are working hard and no one can be accused of not giving it their best effort, unlike the team that Shearer inherited. The point is compared to the top sides there`s a decided lack of quality once you get passed the starting lineup, whereas Spurs have guys like Kranjcar not even making the bench. And the fact we have been associated with Keane who is`nt getting any playing time with Spurs, what does that say about us ? please, dont waste money on guys going nowhere, or you will end up with a nowhere team. And if in fact Ashley is serious about the club, then also get a manager that reflect`s it, say one of the Dutch masters, Jol perhaps ? cause i just don`t see Pardew as the answer.